Our build-it-yourself cedar organizers are easy to assemble, keep moths and other insects away, and keep your clothes smelling great! This product isn’t limited to a simple closet organizer. Using the pieces provided here, you can build your own bookcase, product display, pantry organizer, and more! Built from 7/8″ thick Eastern Red Cedar for strength and durabilty, our cedar organizers are made to last for years to come. 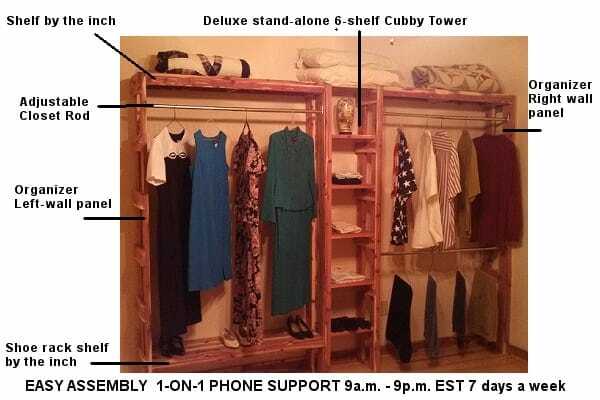 Phone support is available from 9AM to 9PM EST, 7 days a week if you have any difficulty assembling your new organizer. Call 706-455-0541 for assistance. Wall Panel Size Choose an option12"16"